I am all about saving energy. 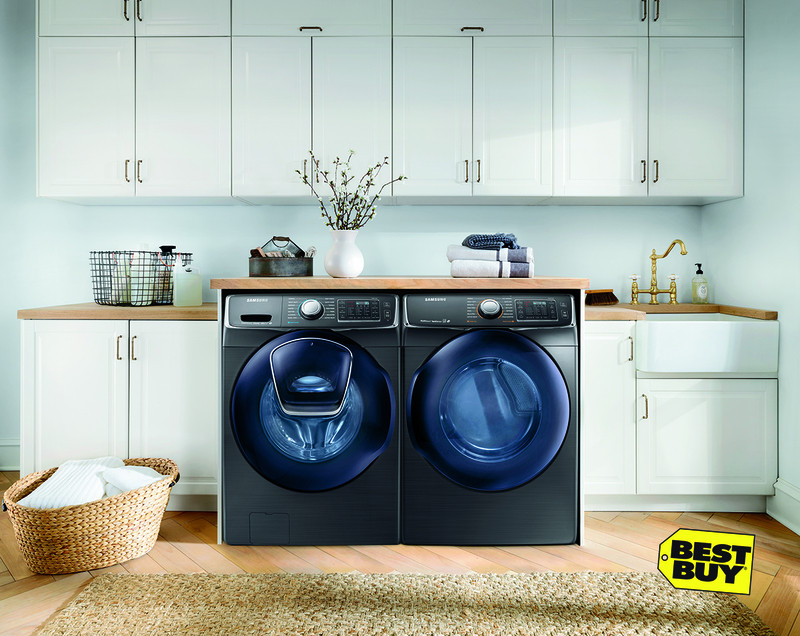 Washing and drying clothes doesn't have to break your electric bill anymore I am stoked to share more about ENERGY STAR® products at Best Buy! Not only does saving energy help protect the environment, but shopping at Best Buy guarantees you will get the best of the best! Why? They are committed to sustainability. If you didn't know, ENERGY STAR certified clothes washers and dryers are 25% and 20% more efficient, respectively, than standard models. You can save $490 over the lifetime of an ENERGY STAR certified clothes washer and even more with an ENERGY STAR washer/dryer pair. Low Heat Setting– Longer drying cycles on a low heat setting use less energy. When you purchase an ENERGY STAR certified clothes dryer, look for the cycle that uses the least amount of energy, sometimes known as the “energy-saving” selection. Steam Cycles– Many ENERGY STAR dryers also include convenient features, such as a steam cycle that can help save time on ironing clothes by preventing wrinkles. Clothes dryers that have earned the ENERGY STAR use approximately 20% less energy than standard models. · If all clothes dryers sold in the U.S. were ENERGY STAR certified, the energy cost savings would grow to more than $1.5 billion each year and 22 billion pounds of annual carbon pollution would be prevented. This is equal to the emissions from 2 million vehicles. Multiple configurations– ENERGY STAR certified clothes washers are available in either front-load or redesigned top-load configurations which include technology innovations that help save energy and water. Sophisticated wash systems– ENERGY STAR certified top-load machines clean your clothing just like standard models without wasting water to fill up the tub. Instead, these machines use sophisticated wash systems to cycle clothes through a mixture of water and detergent, allowing the clothes to be cleaned without using excess water or detergent. No central agitator– Front-load machines tumble clothes through a small amount of water instead of rubbing clothes against an agitator, while advanced top-load machines lift and tumble clothes through a reduced stream of water. Both designs dramatically reduce the amount of hot water and energy used in the wash cycle. High spin speeds– Efficient motors spin clothes two to three times faster to extract more water. Less moisture in the clothes means less time in the dryer and less energy spent drying clothes. Long live your clothes– Front-load and advanced top-load clothes washers’ sophisticated wash systems use a variety of methods to lift and tumble your laundry, lengthening the life of often-washed items. Additionally, because they are so gentle, many models can safely clean silk, wool and other hand-washables. If all clothes washers sold in the U.S. were ENERGY STAR certified, we would save more than $4 billion each year and prevent more than 19 billion pounds of carbon pollution annually. This is equal to the emissions from 1.7 million vehicles. A new ENERGY STAR certified clothes washer will save you about $45 a year on your utility bills compared to a standard model. I don't know about you, but ENERGY STAR has SO many benefits and I LOVE IT! These products are better for the environment! Saving energy means that ENERGY STAR certified washers and dryers help protect the climate, which means that your kids and the planet will benefit for years to come. Learn more on the Best Buy Blog. Be sure to check out this video too. Visit Best Buy to find out more info! You don't want to miss out! Need help? Look for the guys or gals in the blue shirts! Visit Best Buy on their social channels below to stay up to date with the latest!